Forever Shining’s Design-Your-Own Software requires the use of Adobe Flash Player, a plug-in that allows your browser to display dynamic content. Recently, updates have been made to most modern web browsers that block Flash Player, despite it being installed into most browsers by default. 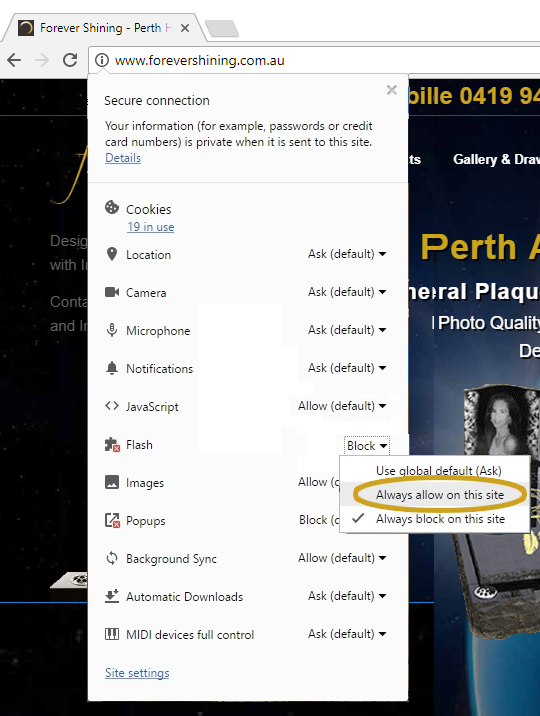 This guide is here to show you how to activate Flash Player with our website so that you can use our innovative DYO software to design memorials, headstones, plaques, and so much more. Google Chrome is the world’s most popular web browser. Most Windows computers, Chromebooks and some Apple Macs will have Chrome installed on them. If you use a program with the above icon when you wish to use the internet, this is the browser you use. Please follow the below instructions. 3: Select “Always allow on this site”. Close out of the site settings and then select the blue “Reload” button. 2: You’ll then need to bring up Chrome’s “content settings”. To find this option, simply type “content settings” into the blue search box, as per the image below. Once you have typed this in, simply scroll down and select the highlighted option from the list that comes up. 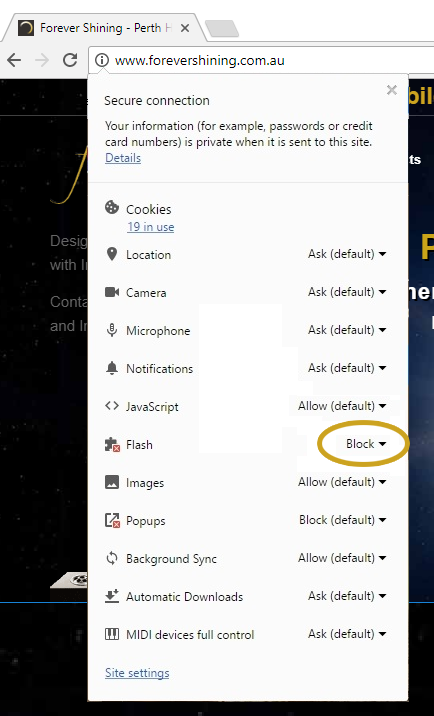 3: Select the option for “Flash” from the menu. …And finally, type “www.forevershining.com.au” in the box that pops up, and click the blue “Add” button. 4: Close down Google Chrome, and re-open it. You should now be able to use the website fully. If this still doesn’t work, you will need to install Adobe Flash Player, which you can download from Adobe’s website. 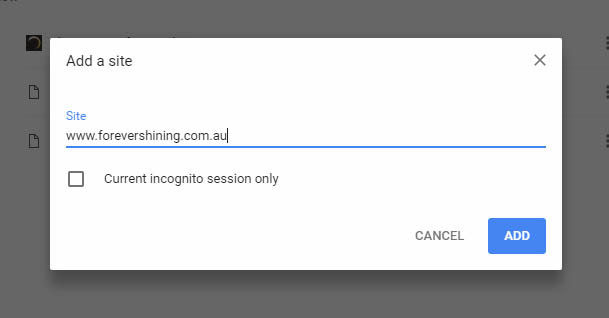 Go to http://www.forevershining.com.au and then select “Allow” on the popup that appears. If the popup does not appear, select the plugin icon (grey block) to the left of the URL. Select “Allow and remember” on the next popup that appears. 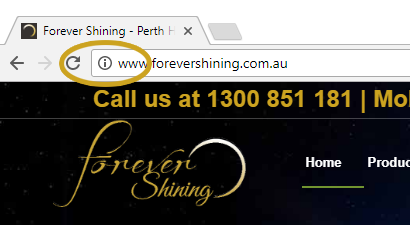 Locate “forevershining.com.au” and then select the drop-down. Select “On”. Select the drop-down for “When visiting other websites” and then select “On”. Select the blue “Done” button. Open the browser setting by selecting the “…” button in the top right of the browser. Locate and select the “Settings” button. Locate and select the “View advanced settings” button. Make sure “Use Adobe Flash Player” is toggled on.